Professional baseball was born in New York City in 1845 when members of the Knickerbocker Base Ball* Club formed and began formalizing the rules of the sport. 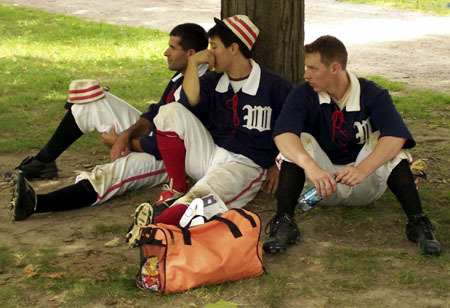 The game has changed, along with its rules, uniforms and etiquette since those early days, but true baseball aficionados can see the game played in its original 19th Century form at Genesee Country Village & Museum‘s premier vintage baseball park. Each year, a dozen teams from across the northeast gather in Mumford, NY to play the three-day round robin-style National Silver Ball Tournament. In 2011, the tournament takes place from Friday, August 5 through Sunday, August 7 at Genesee Country Village & Museum, located at 1410 Flint Hill Road in Mumford. Spectators can catch the games between between 9 a.m. and 5 p.m. Major Event Admission rates apply: Adult $16, Youth 4-16 $10, Seniors 62+ or students with ID $13, children under 3 admitted free. If this article was of interest, you may also enjoy the Travel Maven’s 2009 Article on Genesee Country Village, the National Silver Ball Tournament and Laura Ingalls Wilder Day. For more on Vintage Baseball, visit the Vintage Base Ball Association’s website. *Baseball was originally written as two words. Photo and text copyright 2011 © Carol White Llewellyn.